This is a picture from an artist I've just found out about. Her name is Fionnuala Ní Chiosáin. This painting is called "Infant View" (2001, acrylic, oil, gouache & sumi ink on aluminium). 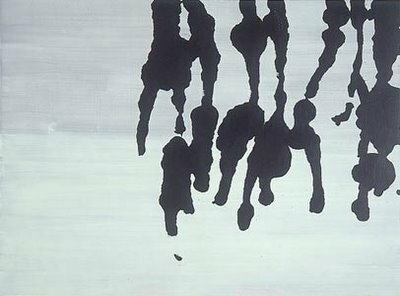 I haven't seen any of her paintings in the flesh, but what I've found on the web look good: here is a link to the main site I've found. She works mainly in water media. What appeals to me is the ink elements, which are very Japanese, in my eyes anyway! 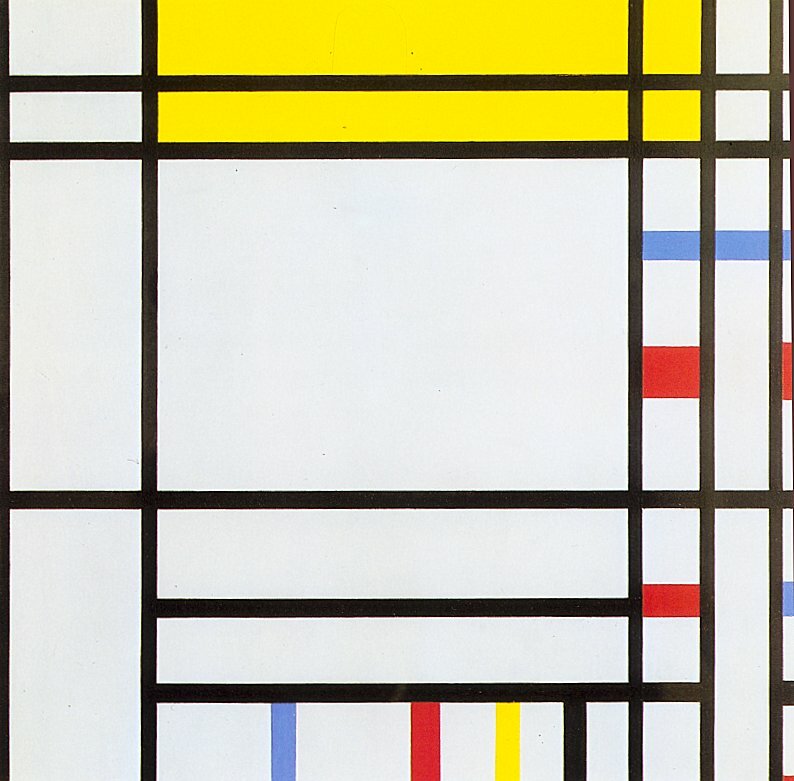 Since Brendan got me 2 canvases, I'm getting started on the next Mondrian-inspired project. This time, my inspiration is the "Place de la Concorde" painting from the Transatlantic Paintings. 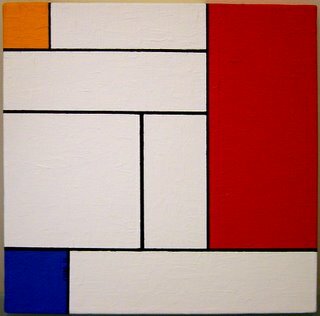 Although I'll be using acrylics again, rather than oils, I'm going to try to emulate Mondrian's brushstrokes more. 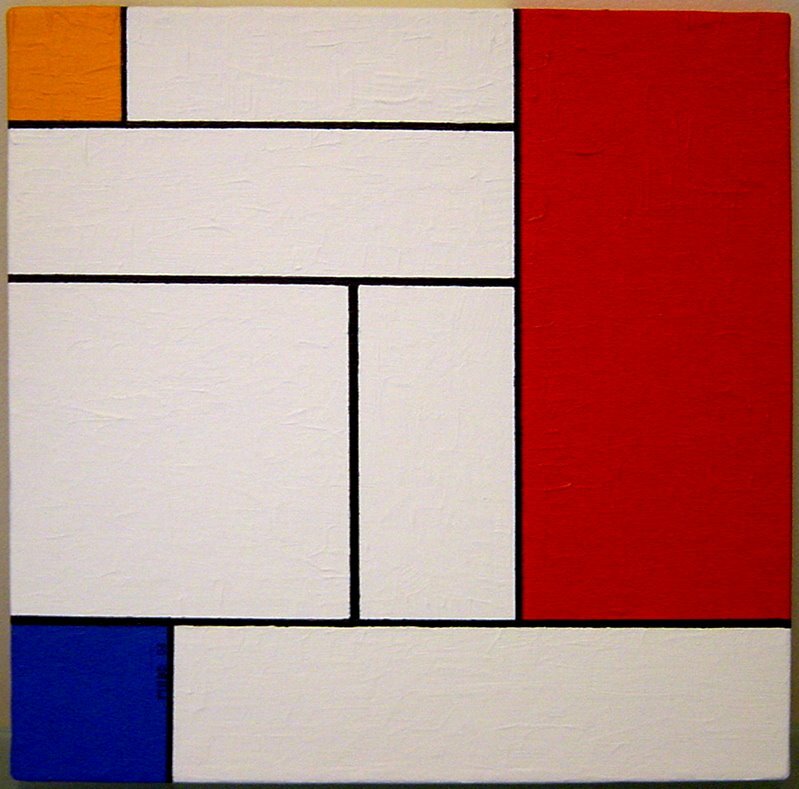 One thing to note, though, is that my canvas is 30cmx30cm, much smaller than the original, which is about 90x90. And of course, I won't be following the long process of starting the painting in Paris and finishing it in New York. Maybe we'll call mine "Namur-Dublin", from the South Dublin Paintings. 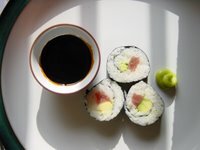 On Tuesday, Brendan and I made our first very own sushi rolls (norimaki) for lunch - with tuna and avocado. Being a fan of everything Japanese, I've been a fan of sushi and sashimi for a long time. Brendan is an enthusiastic convert. One of our favourite restaurants in New York is Minado, an all-you-can-eat sushi buffet. There are a couple of places in Dublin (Aya, YoThai (could not find a link for this one), Yamamori Noodles) where you can get sushi and sashimi, but the quality and quantity is nothing like Minado. Anyway, we decided to make our own, and it was a big success - we got the seaweed sheets, the sushi rice, the little mat to roll the sushi, tuna, avocado, wasabi, light soy sauce. The only thing we were missing was the pickled ginger. The perfect lunch! The book Time & Destiny that I read during the holiday is a piece of Fiction about Eileen Gray, the Irish designer and architect. It was only after reading the book that I had a look on the web at her designs. I knew her name was familiar, but I hadn't connected it with designs I had seen. 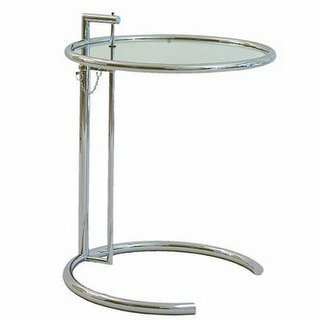 If my memory serves me right, the little tables in the Aer Lingus lounge in Dublin airport are Eileen Gray tables. I like the Bibendum chair too! "Her legendary Adjustable Table E 1027 has been added to the permanent collection of the Museum of Modern Art, New York, in 1978." 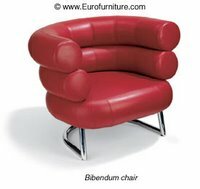 You will find some of her designs at this site and this site. Et pour ceux d'entre vous qui parlent français, ce site donne des détails intéressants sur les laques d'Eileen Gray, et présente une photo du paravent "Le Destin" dont parle le livre "Time & Destiny"
"A free six-page guide to The Kite Runner for reading groups is available to all UK readers. The guide contains discussion topics, background to the writing of the book and suggestions for further reading. To order your guide, please send an email to: thekiterunner@bloomsbury.com or log on to: www.bloomsbury.com/khaledhosseini." Does that sound too much like homework? We got back home yesterday afternoon after the long journey back. Left Baros by speedboat at 23:45. Got to the Airport at 24:00. Flight took off at 2:30. Got to Dubai around 5:30 local time. Flight to Manchester took off around 8:00. We got to Manchester around 11:30 I think. Then, our flight to Dublin was at 13:30. The hardest bit was to remain awake in the Hulule airport before the first flight. Hulule is a fantastic location for an airport, with a runway that starts and ends in the ocean, but in the middle of the night, it's not the most exciting of places. Here are some pictures of Hulule airport. If you want to see more pictures, go to Google Images and type in Hulule airport. You'll even find pictures of the toilet facilities from a Japanese web site that seems to be dedicated to "World Toilet Information"! We picked up Willow from the cattery at about 5 pm. He looked very cosy when we got there - all cuddled up on his cushion. He was delighted to get home, as always, and went around his territory to make sure Nemesis (the black and white cat with which he has regular fights) hadn't returned. I was wrecked - I'm not good with sleep deprivation. But I feel better now after a good night's sleep. I've taken it easy today, and I've tidied up most things. I used to be obsessive about unpacking as soon as we get home. The fact that there are still bits and pieces to be tidied up is a sign that I'm a lot more relaxed than I used to be. I have tons of pictures and watercolour impressions. I'll post these over the next while. And I'm delighted to say that we even have pictures of an octopus, which we saw on our very last day. Despite the flaky connectivity, I'll post a short blog today (we still have about 3 hours to go on our 24-hour subscription!). I'm sitting on the porch, while Brendan is sitting on the beach. I've finished reading my two books - Time & Destiny, by Patricia O'Reilly and The Kite Runner by Khaled Hosseini. I enjoyed them both. I haven't read as much as on other holidays. And of course, I also brought my watercolour pencils and my standard pencils, so I've spent a good bit of time playing with colours - very hard to capture the exact colours and reflections of the lagoon! It's been strange to live without writing my blog for a week, but, despite the claims in the brochures, Baros's wireless internet in the rooms wasn't quite up and running yet. It is now - mind you, it's not free - at 25 dollars a day, I don't think I'll be using much of it - but, at least I can spend a bit of time now to tell you all about it! Did you look at the pictures of Baros in my previous posting? Did the rooms look gorgeous? Did the outdoor bath and shower look tempting? Well, it's all true. My favourite room is the outdoor bathroom of course, with a shower at the end of the little garden. When you look up from your early evening shower, and you see the sky turning to pink and the bats flying over to go over to their favourite tree, it's heaven (well, most of you probably don't like the bit about the bats, but I quite like bats, there is something graceful about them - Mike, you're probably thinking "she likes the bats, but she's saying she can't go to South Africa because she's afraid of snakes and creepy-crawlies!!! What's wrong with this girl???"). So, the rooms are gorgeous, the beach is the same as ever, i.e. peaceful and sunny (mind you, a little bit too windy for me, but Brendan enjoys the breeze), and the reef is full of all the fish we love. I found my beloved blue triggerfish shoal exactly at the same spot as always, feeding away in the current. We have seen the 3 eagle rays going by the reef several times, we've seen one of the moray eels a couple of times, and we saw one of the turtles on our first day. We've seen some new fish too - got a good look at a barracuda and we came upon a big shoal of big batfishes yesterday. I'm still on the lookout for the 2 octopi. 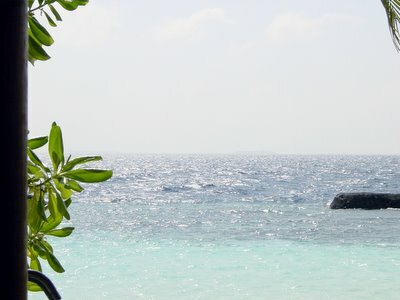 Given that we only ever saw them one year, out of the 10 years we've been in the Maldives, I'm not too optimistic, but I'll keep looking! PS - Lorna - Sorry I could not say Hello to Room 150 - It doesn't exist any more. The highest number is 125! The bags are ready and Willow is at the cattery in Rathfarnham. He seemed to be quite happy to be going there. He was hiding under my desk when we went to pick him up to put him in his carrier, but he stayed quiet in the car on the way over - only one squeak. When we go to the vets, he miaows the whole way down, in protest. Last night, I went to see Memoirs of a Geisha with Mary in the Ormonde in Stillorgan. I enjoyed it (a few tears at the end - it was a love story after all!). The sets and costumes were fabulous of course. The whole movie was a feast for the eyes - there was one scene towards the end where she stands under a gazebo by a pond - it's autumn and the trees' reflections in the water are all golds and rusts, and she is wearing a kimono with pale gold autumn leaves on it. The only thing I didn't like was the fake Japanese accents put on by the actors. I would have preferred it in Japanese with subtitles or in English without accent. A lot of the actors and actresses in the movie are not Japanese, so I guess it would not have been possible to have the dialogs in Japanese. 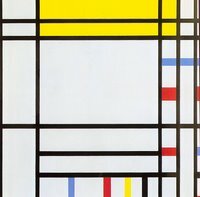 Yes, I'm still working on the Mondrian look-alike - I'm at the stage where I need to tidy up my black lines - masking tape on canvas isn't 100% leak-proof! No doubt I'll be posting more on this subject! !